Home » 5 Freshest » Haribo Gold Bears FAN EDITION!!! In terms of candy news, this is big. I need you all to stop what you’re doing ndt take this in. Breathe it in. 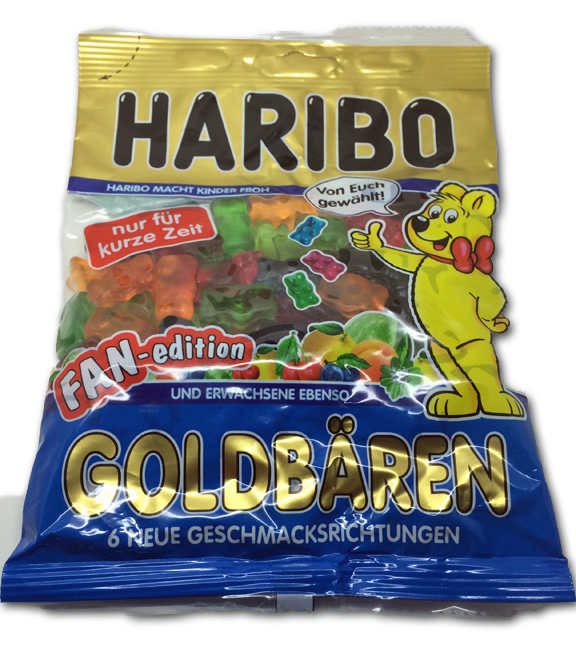 Haribo Gold Bears have a special fan-picked edition composed of new flavors. Apricot, woodruff, cherry, grapefruit, blueberry & watermelon. We’ve discussed woodruff here a few times, but in short: it’s a plant that many Germans (among others I’m sure) use to sweeten wine & other things. I’ve tried on several occasions to properly describe it, but I can’t seem to nail it. It’s grassy, it’s earthy, it’s…unique and a bit weird. Oddly for for me though, I enjoyed it. It was the first flavor I tried from the 6. It’s interesting-it invoked mint for me, subtly. Nice. That’s sort of where the good news ends. I know-massive bummer, but I gotta be real. The cherry, watermelon and apricot all had a very similar taste to each other, at least to start. And they never truly developed in a strong way. Not unpleasant, just…not noteworthy. The fact that I truly couldn’t discern their flavors at all for the most part was lame. Super lame. The blueberry had a distinct flavor, but….I wasn’t identifying it as blueberry. Highly perfumed….it was ok, but I wouldn’t seek it out. That leaves grapefruit, which was absolutely outstanding. Immediately you’re hit in the face with crisp citrus, and the flavor is perfect. 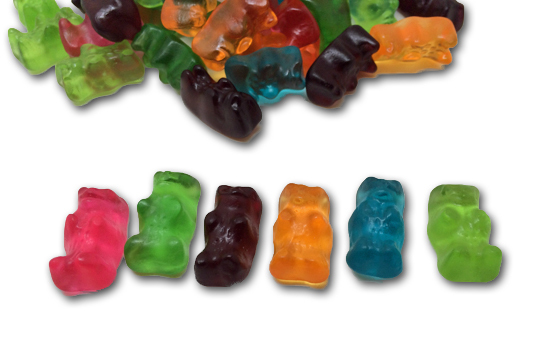 The news that Haribo released Gold Bears with different flavors would normally be a big dang deal. 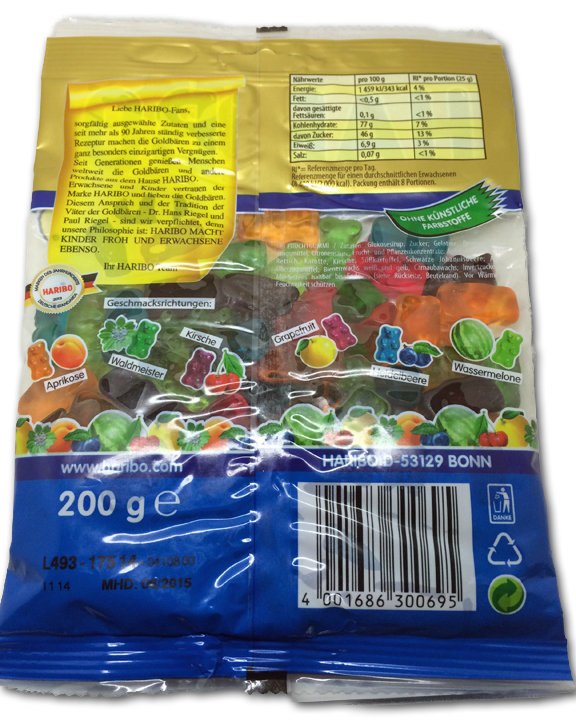 However, as all of you know being faithful readers, Haribo released something called “Haribo Gold Juicy Bears” a couple years back, and those, my friends, are what you need to seek out. I won’t rehash my overly glowing review of them here, so click this link to check it out. In short, Haribo Gold Bears are classic. Amazing. Shouldn’t ever be changed. 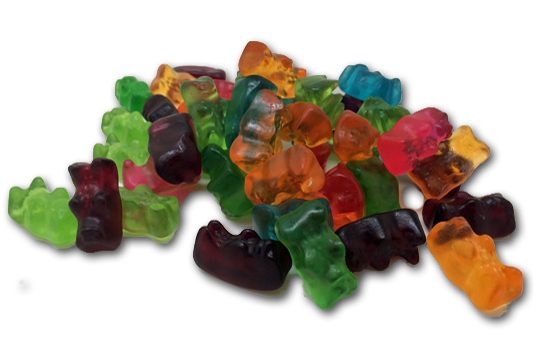 But if you’re in the mood for that Haribo quality and chew and feel, but with new flavors, check out the Juicy Bears. Sometimes I feel like they’re even better than the original Gold Bears, THEY’RE THAT GOOD. But judge for yourself. These though? I appreciate the effort, but the execution just doesn’t seem up to par for Haribo. For most any other confectioner, they’d be more than fine. But we’ve come to expect better from the ‘Bo. Heartbreak. How can they release cherry and watermelon gold bears and not execute. These are two of my all time favorite flavors. Plus the Haribo cherries are already amazing??? Port the flavor over! Right. Obviously you know what’s up- and I was SO EXCITED to try these. Like I said the grapefruit is legendary, but one flavor does not a bag make.